There are a couple of cakes that I make that the kids go crazy over. 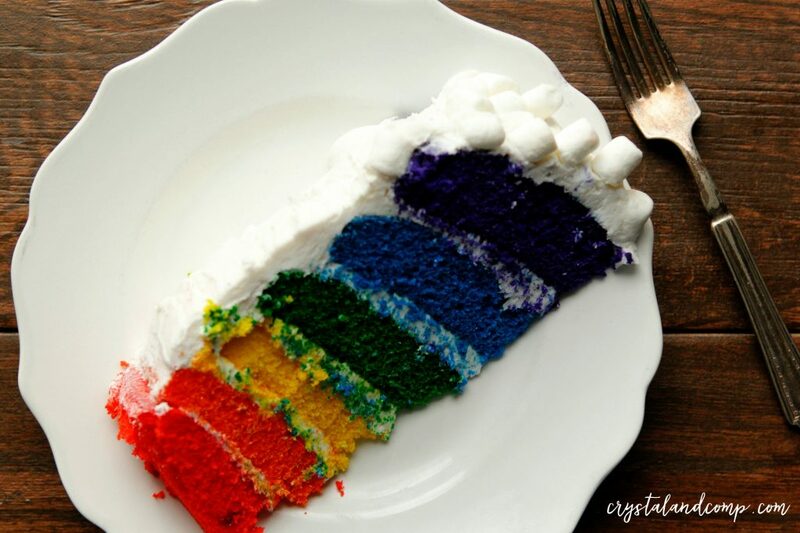 This rainbow cake it one of them! I made it for the first time when Nick and Luke turned 4. Um, they just celebrated their 12th birthday recently and THIS cake is one they ask for often. The only thing is, it is tedious and timely to make. And honestly, it is kind of messy. So last week when I made it as a surprise, everyone’s eyes lit up. 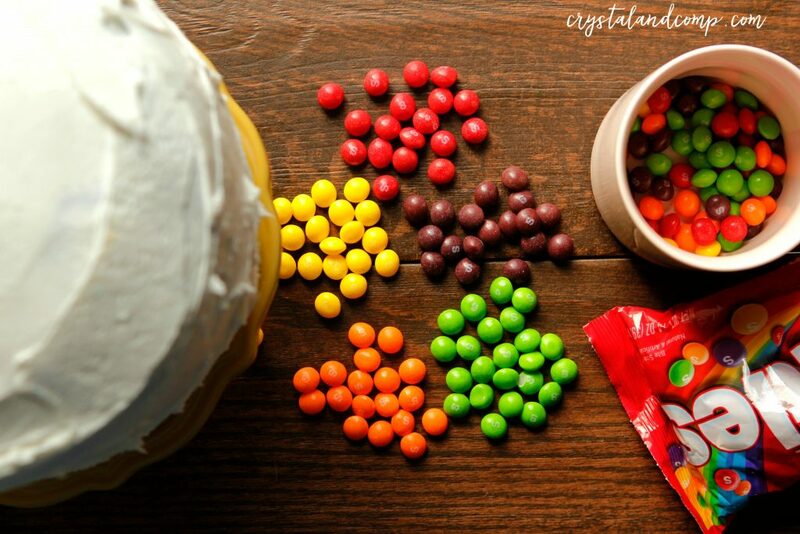 They know, when I start breaking out the Skittles, multiple cake pans and TONS of icing, they know what’s coming. Let me show you how we make this. I don’t want to discourage you when I say it is messy and time-consuming, but I just want, to be honest. 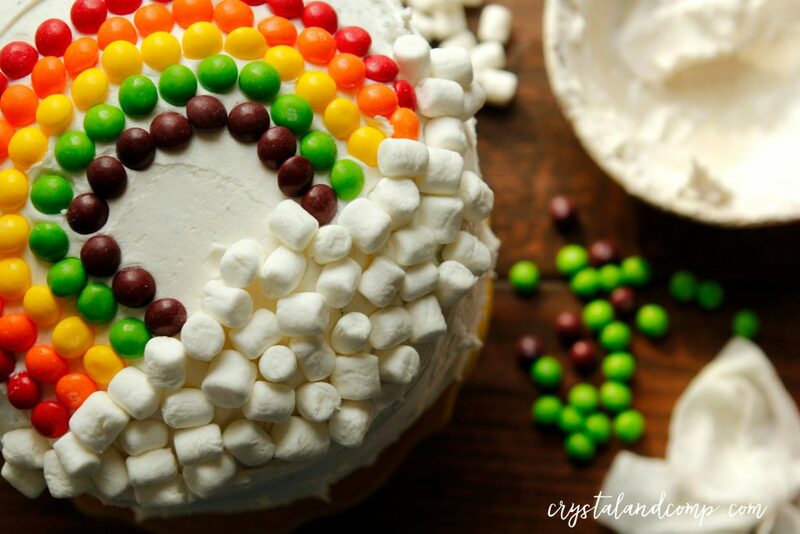 Nonetheless, it is an amazing time to make memories together and it is a great opportunity for homeschooling because there are some math and life skills that go into this cake. Plus, who does not love a rainbow! Here is the year they turned 4 and we made this cake. I know it’s not a large picture and it is not one you will likely see on Pinterest, but it is our memory. My sweet babies are not babies anymore. In a standing mixer, mix up the two boxes of white cake mix following the instructions on the back of the box using the listed ingredients (water, oil and egg, usually). Once the cake mix is mixed well, divide the mixture up into six smaller bowls. We did about 1 and 3/4 cup of cake mix per bowl. 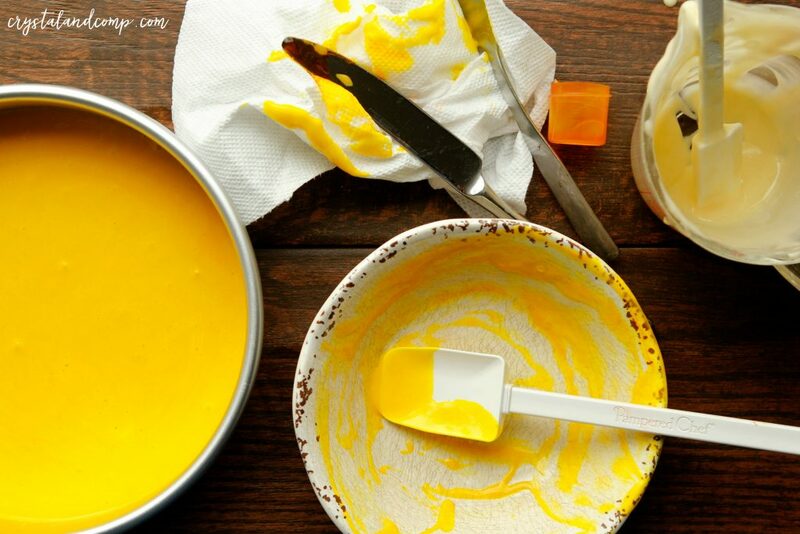 Color each cake batter batch with the icing dye. 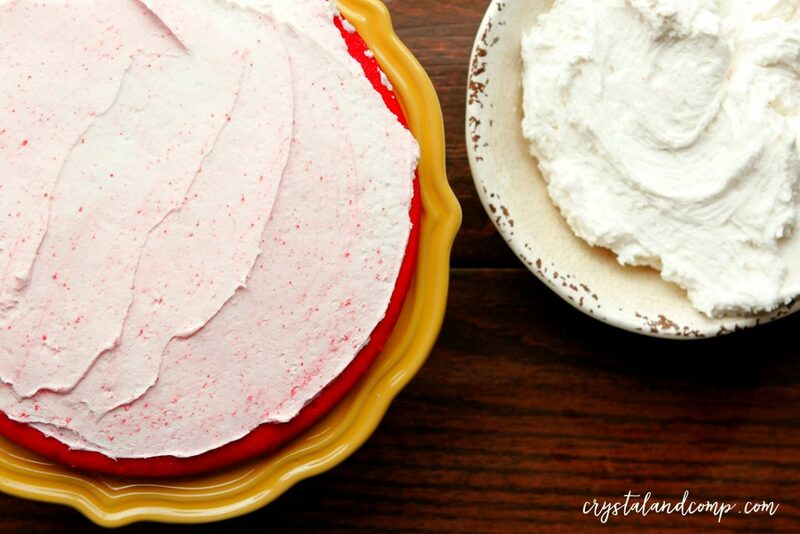 There is a link above for the icing dye that I use. So you will have one bowl of red, one bowl of yellow, one bowl of orange, one bowl of green, one bowl of blue and one bowl of purple. If you want to do one violet and one indigo to be super specific, you can. 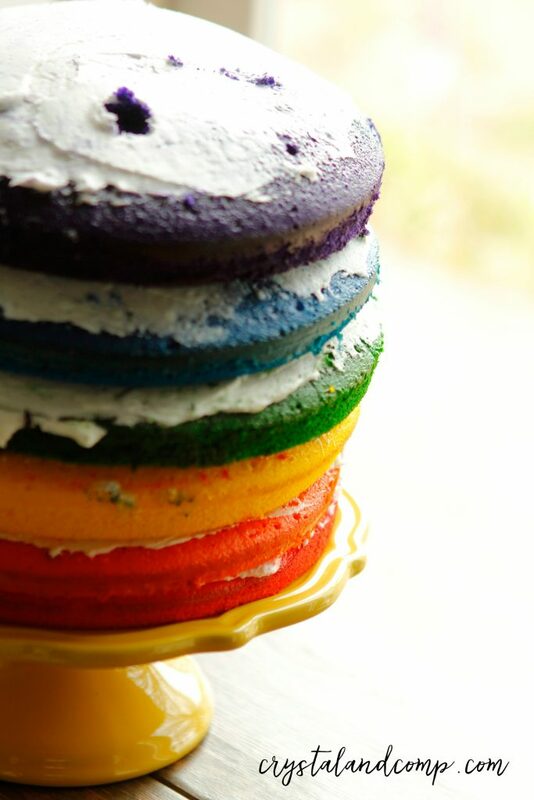 Personally, six layers of cake is already a lot. 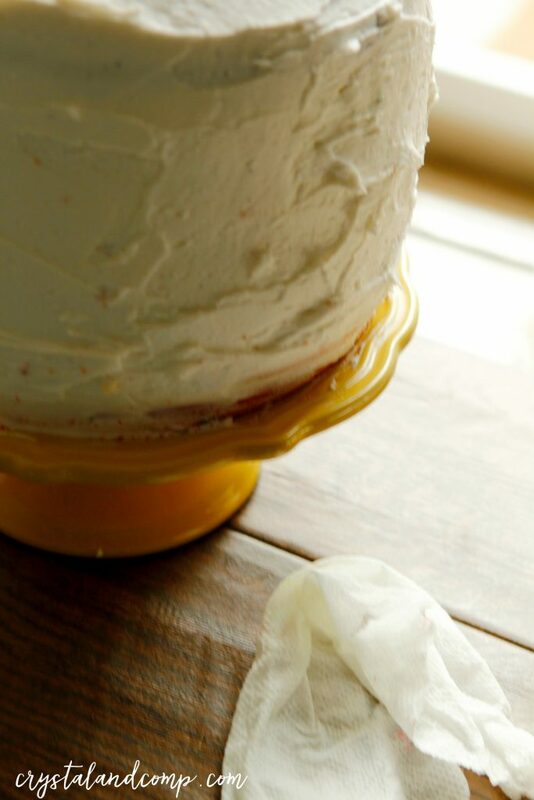 I also love to keep Bounty paper towels handy when I am doing messy baking like this. Especially when using icing dye. They are more absorbent and make clean up so easy. I used 9 inch round pans. You could use an 8 inch if you want. Whichever you decide, stick to that size for all layers. I have 3 pans, so I did the red, yellow and orange and baked them all at the same time. Put them in a 350° oven for 9-12 minutes. Then I cleaned the pans and bakes the blue, green and purple batter. As the layers are done baking let them cool for 10-20 minutes before removing them from the pans. Place on a cooling rack until 100% cool and ready to ice. Meanwhile, prepare your icing. This is my recipe but I have also used this. Once the layers are cooled you can start stacking and layering. I accidentally started with the red layer. Really you want to work backwards and start with the purple layer, but either way is fine. First, you want to dirty ice and just ice the top, then stack the next color and ice the top, then stack the next, etc. Once you have iced and stacked the layers, run 3 wooden dowels through the layers. This will keep it from sliding and falling. Just break them down to a size that is right. Once you’ve totally stacked the layers, then you can ice the sides and make it a smooth pretty white icing layers all over the cake. Once I have iced it I like to use a wet Bounty paper towel and wipe the edge of the cake plate to make it clean and pretty. Next, separate out your Skittles by color. 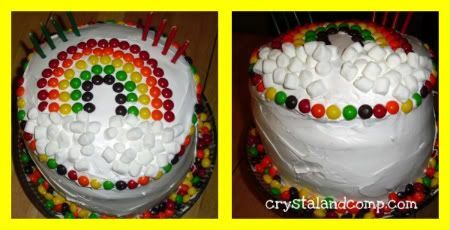 Then add them in the shape of a rainbow on top and use small marshmallows to make the shape of clouds underneath. Is this not the most adorable and fun cake ever?!?! Here is the one I made on their 4th birthday. I added Skittles around the top and bottom as well. Look at how beautiful it is when you slice it. It’s so moist and delish! It’s the cake that brings a smile to everyone’s face!! Here is the one I made way back in 2010. This one goes from red to purple instead od purple to red when you cut into. Honestly, the kids don’t care either way! Enjoy… then prepare yourself for an adult sugar coma and stomach ache as your children rage in hyperactivity and bounce off the walls. I can not take the credit. I found the idea and recipe at an awesome mommy blog- The Idea Room. I took her version and improvised a bit. Now THAT is a super cool birthday cake! I would love that cake for Simon's birthday July 28……wow, that is beautiful. the more I look at the more I want to take a huge bite out of it. That has got to be the coolest cake that I've ever seen!!! Thank you so much for sharing it with all of us. Oh, wow! How cool is that?! Love it! Holy Moly…now THAT is a cake!!! I kinda sorta really want one! wow, pretty intense! Must have taken forever but I am sure the boys LOVED it! 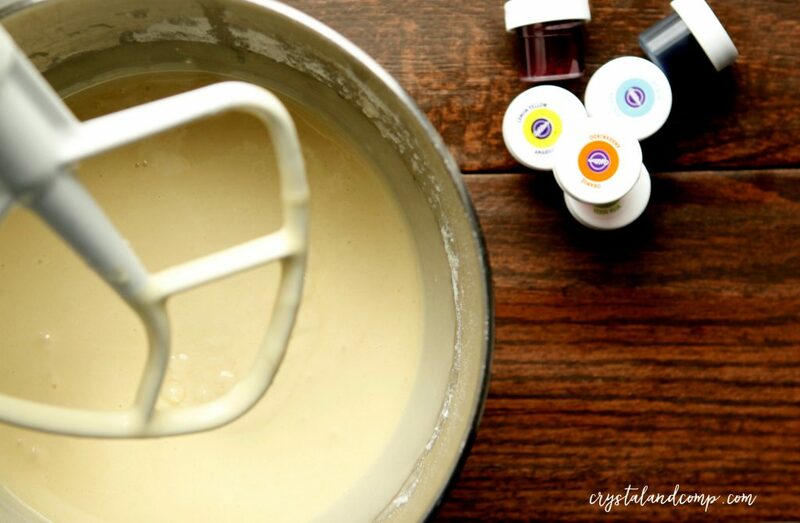 Erin- it is 2 white cake mixes… really pretty easy. Every time I look at the rainbow cake I get hungry. I want this cake so bad. My sons birthday is the 28 July and my grandsons aug 8….it's so pretty. I would love to feature this during my month of St. Patrick's Ideas if you don't mind! ?? I loved Rainbow Bright as a kid! Loved her! Please, share! I would love that. I'm bookmarking this! My daughter has a b-day coming up and she would LOVE this!! Visiting from The Girl Creative linky! So adorable! I can't wait to make one of these for my little girl. I love it! AMAZING Beautiful CAKE!!! I think even my 17 year old TWINS would love this cake! We would LOVE for you to come over to THIS WEEK'S CRAVINGS and link it up! This week our theme is KID-FRIENDLY and every kid (big or small) would LOVE this! Please come on over and link up! 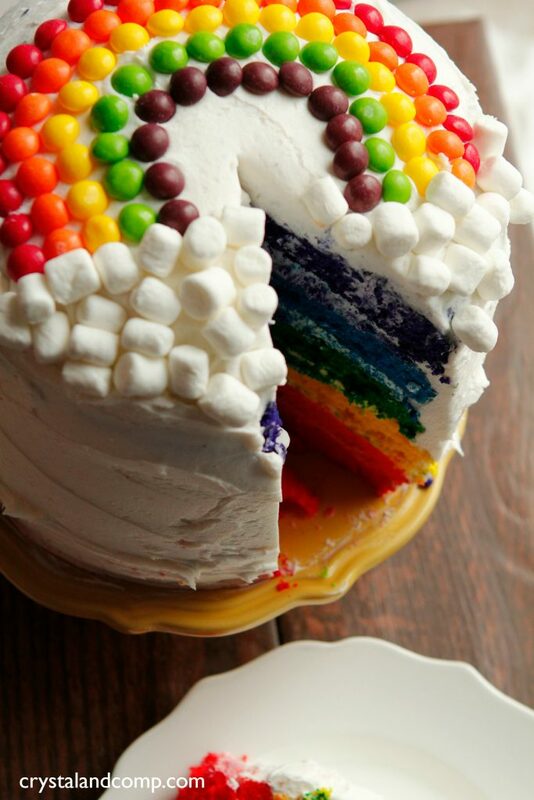 Love this rainbow cake! I think I will go around the neighborhood and borrow some baking pans 🙂 I only 1 round pan. Thank you for sharing the tutorial!